Honda Motorcycle & Scooter India (HMSI), the wholly-owned two-wheeler subsidiary of Japan's Honda Motor Company, on Wednesday launched its new 'Aviator' model scooter with 15 per cent increased fuel efficiency. The ex-showroom price is Rs 50,410 for its deluxe model and Rs 45,180 for its standard model. The scooter will be available in five different colour variants, HMSI President and CEO Shinji Aoyama said. Aviator, its first model, is HMSI's most popular scooter among Indian males. The new model comes with a 110 cc engine and will deliver a power of 8 bhp and is more economical than the previous model due to the increased fuel efficiency, he said. The model targets married males in the age group of 30-40 years and costs about Rs 3,000 more than the previous one which will be discontinued after the market entry of the new model, the top official said. 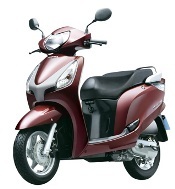 This year the company is planning to sell 12.5 lakh two wheelers in the Indian market. Last year, the company had sold 10.7-lakh units, Naresh Kumar Rattan, general manager, sales & marketing, HMSI said. Will Hero Honda remain the leader? Debate: Do Indian CEOs overpay themselves?